I've owned this mower for over 4 years and generally it has been a decent mower. It has some issues with fuel staying in the carburetor even after you think you have run it all out, for example, storing it for the winter. It cuts well with maintained blades and hasn't had any running issues other than needing the carburetor cleaned out before I start each mowing season. The bagger option works fine for light to medium amounts of grass, but if you have a large amount of leaves or bare "dirt" spots in your yard, it had a tendency to stop up the chute. The bagger's holding bins, work well enough, but seem kind of small to me, but I only use the bagger about twice a year so it's manageable. 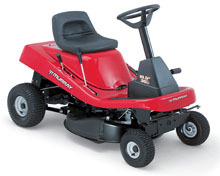 The major issues I have had with the mower, besides the carburetor problem, is the tires and the battery. Each year I end up replacing a tire on this mower, and finally resorted to getting two new rims and tires for the front to fix the problems. It didn’t matter if it was tubeless nor had a tube in it, the front tires would just always leak down. This wasn’t an issue with the rear tires. After replacing the rims/wheels, the problem has hopefully went away, but we will see in a few months. I replace the battery with the “Walmart” brand battery at the start of each mowing season and have quit trying the “charger” methods. The battery that comes with the mower is cheap, and as cheap as a new battery is, I just found it a lot simpler to swap the darn things out at the start of each season. Remember, this isn’t a Snapper you’re buying so be prepared for some lower quality parts. Join in and write your own page! It's easy to do. How? Simply click here to return to RIDING mowers - murray.